Buyers, Retailers, Wholesalers, OEM Manufacturers and Vendors face many challenges in managing product/project development, sourcing & procurement, production & quality control, inventory, logistics, forecast and finance. Buyers want to streamline their business not only to reduce administrative costs, but also to shorten lead times to enable more frequent orders. 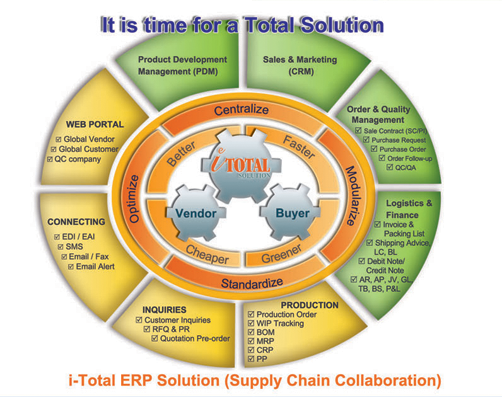 is a total ERP solution that offers solutions to the Buyer, Seller and Manufacturer to help them to streamline their business processes across the end-to-end sourcing lifecycle - from product/project development to costing, from customer orders to production plan (BOM, MRP, CRP), from QA to QC, from warehouse to shipping/logistics, from order to payment, from cash flow to forecast. Adopting this system for your daily operation will greatly improve your efficiency, less manual mistakes, increase productivity and competitiveness in this fast-paced, modern world of business.